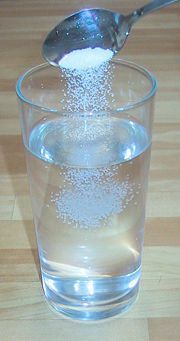 Dissolving table salt in water. In chemistry, a solution is a combination of two or more substances to form a homogeneous mixture. The medium that dissolves the other substance is called the solvent; the substance that become dissolved is called the solute. The materials mixed together can be in the solid, liquid, or gaseous states. Water is a common solvent that can dissolve many other substances. Thus a solution is produced when a solid such as table salt or sugar is dissolved in water. Also, gases such as carbon dioxide and oxygen can be dissolved in water. In addition, liquids may dissolve in other liquids, and gases in other gases. Alloys are examples of solid solutions. If the solute and solvent exist in equal quantities, such as a 50:50 mixture of ethanol and water, the concepts of "solute" and "solvent" become less relevant. In such a case, the substance that is more often used as a solvent may be designated as the solvent—in this example, it would be water. An ideal solution is defined as one in which the interactions of the molecules of the solvent with one another are equal to their interactions with the solutes. The properties of an ideal solution can be calculated by the linear combination of the properties of its components. Solvents can be broadly classified into polar and nonpolar solvents. Generally, polar or ionic compounds will dissolve only in polar solvents, while nonpolar solutes dissolve in nonpolar solvents. The general rule of thumb is, "like dissolves like." The polarity of a solvent is commonly measured in terms of its dielectric constant. Water, a highly polar solvent, has a dielectric constant of 78.5. Ethanol, with a dielectric constant of 24.3, has intermediate polarity. An example of a nonpolar solvent is hexane, which has a dielectric constant of 1.9. A simple test for the polarity of a liquid solvent is to rub a plastic rod, to induce static electricity. If this charged rod is held close to a running stream of the solvent and the solvent's path deviates, the solvent is polar. The molecules of some substances, such as sodium dodecyl sulfate, have polar and nonpolar regions. This class of molecules (called amphipathic molecules) includes surfactants, like soaps and emulsifiers. The molecules of the surfactant can stabilize emulsions by aligning themselves at the interface between the polar and nonpolar liquids, with their polar ends in the polar liquid and their nonpolar ends in the nonpolar liquid. Within a solution, molecules or ions of the solute become surrounded by solvent molecules. If the solvent molecules form relatively stable structures around the solute molecules, this process is known as solvation. For example, when table salt (sodium chloride) is dissolved in water, the polar water molecules surround each of the sodium ions (cations) and chloride ions (anions) to form relatively stable structures. Thus, solvation allows the solute-solvent interaction to remain stable. There are several ways to measure the strength of a solution. The amount of a solute that is dissolved in a unit measure of solvent is called the concentration of the solution. It may be measured in terms of grams of solute per liter of solution, or moles of solute per liter of solution, and so forth. To concentrate a solution, one must add more solute or reduce the amount of solvent (for instance, by selective evaporation). Conversely, to dilute a solution, one must add more solvent or reduce the amount of solute. The amount of a solute that will dissolve in a specific amount of solvent under given conditions is called the solubility of the solute in that solvent. When no more of a solute can be dissolved in a solvent, the solution is said to be saturated. However, the point at which a solution can become saturated depends significantly on environmental factors such as temperature, pressure, and contamination. Raising the solubility (for example by increasing the temperature) to dissolve more solute, and then lowering the solubility causes a solution to become supersaturated. In general, the higher the temperature of a solvent, the more of a given solid solute it can dissolve. Some compounds, however, exhibit reverse solubility, which means that as the solvent gets warmer, less solute can be dissolved. Some surfactants exhibit this behavior. The solubility of liquids in liquids is generally less temperature-sensitive than that of solids or gases, while gases usually become less soluble with increasing temperature. Unless two substances are fully miscible, there exists a concentration at which no further solute will dissolve in a solution. At this point, the solution is said to be saturated. If additional solute is added to a saturated solution, it will not dissolve. Instead, phase separation will occur, leading to either coexisting phases or a suspension. The point of saturation depends on many variables, such as ambient temperature and the precise chemical nature of the solvent and solute. "Total dissolved solids" is a common term in a range of disciplines. It is expressed in different ways, depending on the analytical method used. In water quality, it refers to the amount of residue remaining after evaporation of water from a sample. Streitwieser, Andrew and Clayton H. Heathcock and Edward M. Kosower, (1992). Introduction to Organic Chemistry, 4th ed., Macmillan Publishing Company, New York. ISBN 0-02-418170-6. This page was last modified on 4 April 2008, at 01:20.